Tai chi is an ancient Chinese practice that combines deep breathing and relaxation with gentle, slow movements. Tai chi was developed as a martial art in China in the 13th Century; however, today it is practiced as a health promoting exercise the world over. The practice involves moving meditations, a very low-impact exercise that puts minimal stress on muscles and joints. Some studies have shown that tai chi can help improve mobility in the knee, hip, and ankle in people who suffer from Rheumatoid arthritis. Tai chi helps improve flexibility, which in turn improves your range of motion. This helps you become more functional. Being flexible helps keep your entire body healthy and also allows you to become more active. 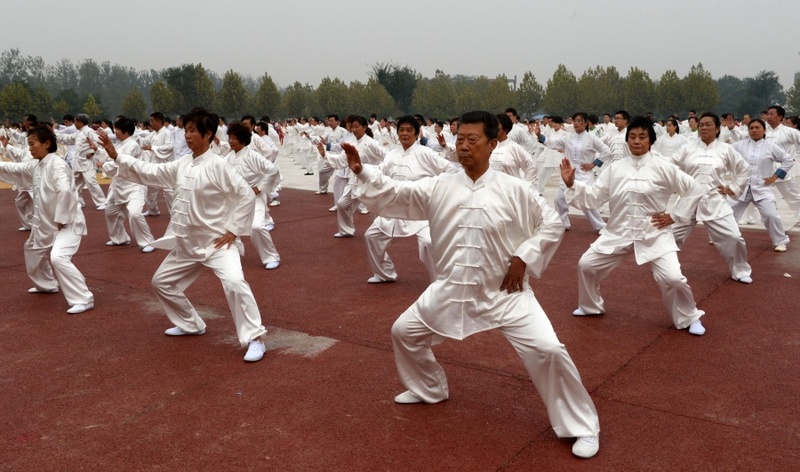 Tai chi helps you strengthen your muscles, which in turn keeps your joints stable and protected. Apart from helping improve the functions of your joints and organs, strengthening your muscles also improves the overall function of your entire body. Practicing tai chi leads to improved cardio-vascular fitness, which refers to better heart and lung capacity. Improved supply of oxygen and blood leads to better health and fitness. Tai chi is a tool to help us cope with our busy, hectic lifestyles that characterize our world today. It helps us appreciate the tranquility as well as the nature around us. In other words, it helps us relax, leading to reduced stress. Tai chi is also known to improve posture, which is an important component of good health. The importance of developing the correct posture is that it leads to less wear and tear of your joint muscles. In addition, your body also works better in an upright posture because the lung space is larger. It is well known fact that your mind is a very important aspect of your health. Your mind actually controls your body. It is possible to overcome a disability just because of having a positive attitude and strong mind. Tai chi teaches you how to become aware of the intrinsic energy from which you can perceive greater empowerment and self-control. As a matter of fact it is not easy to lift your mood or spirit using your conscious mind. Essentially, you can only control your mood and spirit using your subconscious mind. In addition, your subconscious mind has immense power to control you. In the world we are living in today, stress, negativity, as well as negative emotions have the ability to accumulate and dampen your spirit. Tai chi can help you because it helps you achieve harmony with nature as well as balancing mental serenity and physical strength. Essentially, having better balance has the ability to calm the unconscious mind. Tai chi is known to enhance the qi–vital life energy, which is the path to uplifting your spirit. Qi can be described as life energy within every human being. Your mind can learn to enhance qi during tai chi practice, which can in return connect to your subconscious mind and enhance your mental attitude. This can only happen when you are well balanced and in harmony. In this state, your body is relaxed and calm, and your mind is receptive. At this point, your qi will start to circulate, allowing your spirits to soar.